Many people look forward to the mail. Your grandparents or great grandparents, for example, probably lived a lot of their lives before this age of email, iPhones and SnapChat. They might have eagerly awaited the daily mail, for letters from loved ones, the Saturday Evening Post, postcards from people on fun trips, and other items that came “in the mail.” Getting the mail might have been a big event, and then throwing all the mail onto the kitchen table, a husband or wife, man or woman might have rummaged through the “junk mail,” the bills, and then the fun stuff – letters from family and friends, as well as magazines and journals. A lot of that has changed today. Today, the mail largely consists of junk mail, bills, and (unfortunately) official correspondence from government agencies like the Bureau of Automotive Repair (if you are an auto repair shop, a SMOG station, or a STAR Program station). Friends and family now share their correspondence via email, Facebook, Instagram and other social media (that’s where the fun has gone). Even magazines and journals now come largely via the Web… so there’s just not that much fun in the mail. Let’s face it. 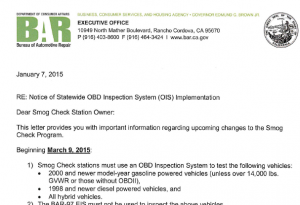 So the day comes: you receive a letter from the Bureau of Automotive Repair. It’s probably not a good letter, and it’s probably not a good day. It’s probably a notice of violation, citation, or accusation. You are probably not equipped to understand the legal jargon on that letter. Did you do something wrong? Did one of your tech’s allegedly and improperly smog a video? What about the infamous Bureau of Automotive Repair undercover cars, did one of them visit your shop? Your first thought is probably: anger. Anger that you have a “new hassle” courtesy of the Bureau of Automotive repair. At the very least, you have to respond, even informally (which is sometimes an option). It’s the government – so you can’t ignore it. That will make it worse, a lot worse. Your second thought is probably more systematic. What can you do? Who would be an expert in Bureau of Automotive Repair legal matters, even litigation? So, you’re likely to go to Google (or Bing) and start searching for “attorneys specializing in the Bureau of Automotive Repair,” or “Bureau of Automotive Repair lawyers.” You want someone with expertise dealing with the vast bureaucracy in the state of California, including the BAR. You want someone who can go head-to-head with their own high-paid attorneys, someone who understands the law, and can also understand your situation. We are specialists not only in the Bureau of Automotive Repair but we are also attorneys with an experience of (and love for) cars. America’s love affair with the automobile: that’s something for another time. Right now, you may have received a Bureau of Automotive Repair letter. Your next logical step? Reach out for a free consultation. We can help you explore your options.